Brandywine Nurseries has been awarded a landscaping award by the Delaware Nursery & Landscape Association (DNLA) for the Small Residential category. Visited by a panel of judges, the small residential landscaping project by Brandywine Nurseries was recognized for its outstanding landscape by a member. Judging was based on overall design and installation; how well the landscape suites the site; use of structures and paving; use and selection of plant materials; and maintenance, including neatness, proper pruning, and health of plants. 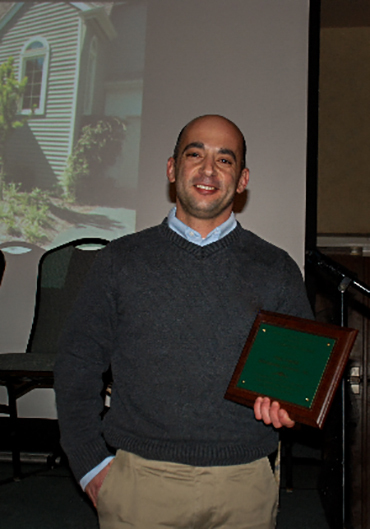 Paul Orpello accepted the award at the Delaware Horticulture Industry Expo in January of 2013. While Brandywine Nurseries doesn't deliver every land care service itself, it can offer them to customers. The Wilmington, Del.-based company works cooperatively with other experienced service providers in its market on different projects. That's what you have to do in these ultra competitive times, says Jamie Jamison, COO of the 65-year-old family business. "You don't want your clients looking at other companies that are more than willing to sell other services to them. You want them looking to your company," says Jamison. "You don't actually have to do the work yourself. Align with people you know who can do good work because it all reflects on you." The key to getting this kind of work is having relationships with other contractors - contractors that offer services you don't, Jamison says, adding that the companies that network are almost always busier than companies that don't. Word to the wise, though: choose your partners carefully. Are they reputable, dependable and honest? Are they financially sound? Are they bonded and insured? Working cooperatively with other service providers is one of the trends that Brandywine, that billed about $2 million in 2011, uses to keep itself relevant in today's business environment. Others include being able to provide services with less labor; running lean. The company has decreased its workforce by almost half in recent years to about 30 employees in peak season. Article onriginally printed in Turf Magazine on February of 2012 in the North Features section. Copyright © 2012, Brandywine Nurseries. All Rights Reserved.